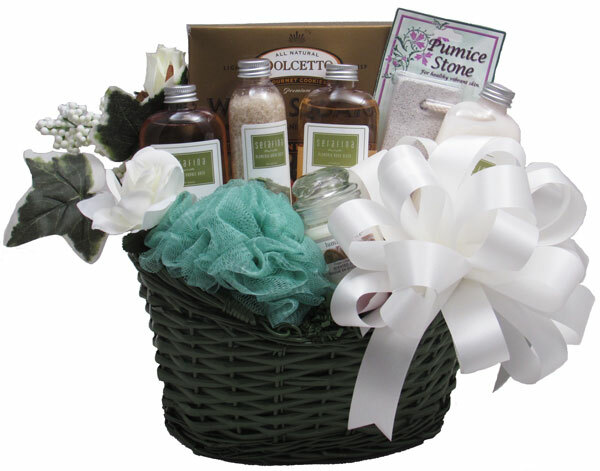 Bath and Spa gift baskets make a great gift for that special person. Filled with the Plumeria Serafina quality bath line, which is purposefully created for those minutes or hours of unyielding relaxation. Serafina's carefully selected products and innovative packaging, are designed to not only feel fantastic on the skin, but to look amazing on the bathtub. Making the next bath a truly soulful experience. Serafina's mission is to help relax and rejuvenate the over-worked and under-rested soul. Draw a hot bath, find a good book, and Serafina's bath products will do the rest. Body Lotion, Body Wash, Bath Salts, and Bubble Bath. We've added a Net Sponge, Pumice Stone, Scented Candle, and Cookies to enjoy! This design is wrapped in Crisp Clear Cellophane and topped off with a Handmade Bow underneath a printed cellophane fan. Beautiful silk flowers and greenery (may vary) are added to the arrangement. Includes a Handwritten Enclosure Card.